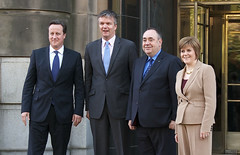 When the Edinburgh Agreement was signed, David Cameron and the rest of the UK government were ecstatic that they had managed to restrict the referendum to a single question, while the Scottish government were saying they had never wanted a second question in the first place, but that they had wanted to keep the option open in case there had been huge demand for it in their consultation. I thought at the time it was a bit odd they couldn’t find the resources to publish the analysis of the consultation responses before the decision was made, but I wasn’t sure what to make of it. However, today the analysis of the responses was published (PDF), and suddenly everything has clicked into place. The consultation responses showed a big majority in favour of a single question, so the Scottish Government could never have used them to put a second question on the ballot paper. In other words, if the Scottish government had released the responses a month ago, the UK government would have realised there was no danger that the Scottish government would actually put a second question on the ballot paper, and they would have asked for something else instead in the negotiations. So by delaying the release of the responses to the consultation until after the Edinburgh Agreement had been signed, the Scottish government managed to get everything they wanted themselves, as well as what the Scottish public asked for in the consultation.